Welcome to Webgains. We’re the high performance affiliate marketing company because we combine cutting-edge technology and world-class expertise that put our clients — from blue-chips to start-ups — at the top of their game. Our market insight leads the field and we believe in sharing this expertise with you. We’re motivated by your success and coach you every step of the way — wherever we can add value. We don’t think of ourselves as a supplier – we’re on your team. This means when you win, we win too. Webgains was founded in 2005 and since 2006 it’s been part of the ad pepper media International N.V., which is listed on the stock market. We know it’s the people that make our company, that write our success stories and that champion our values. We’re passionate about cultivating a work environment that makes our teams feel nurtured and rewards successes, no matter how small. We’re big believers in the value of incremental gains, which means each step counts towards a greater goal in the long-run. Don’t see a vacancy that suits you? We create an environment where employees, clients and affiliates can all grow together and become experts at the same pace. On our academy courses you can learn about the digital industry, including affiliation, social, SEO, CRM and so much more. We’ll give you the knowledge and expertise that’ll put you ahead of the rest. We’re a global company and value our international communities. 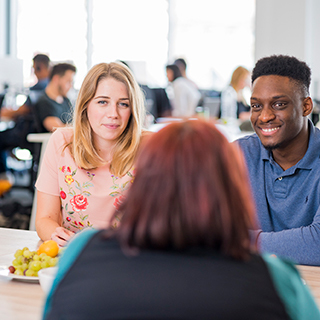 To better connect with our international teams, you can sign up for free, weekly language sessions. Whether you want to learn a new language to enhance your business skills or to scrub up on your knowledge before a holiday, we’ve got you covered. In a global and competitive industry, we encourage our teams to work between our offices in London, Madrid, Bristol, Paris, New York and Nuremberg so everyone can learn from each other. If learning a new language doesn’t feel challenging enough for you, you can experience a new culture instead. Fill in your details below and we’ll get back to you as soon as we can. WANT TO REACH OUR TEAM IN THE USA?